With hot liquid 3 days. With cold liquid 7 – 14 days. Kristyna I love utopenec but I think the best is nakladany hermelin. Please I need the recipe! 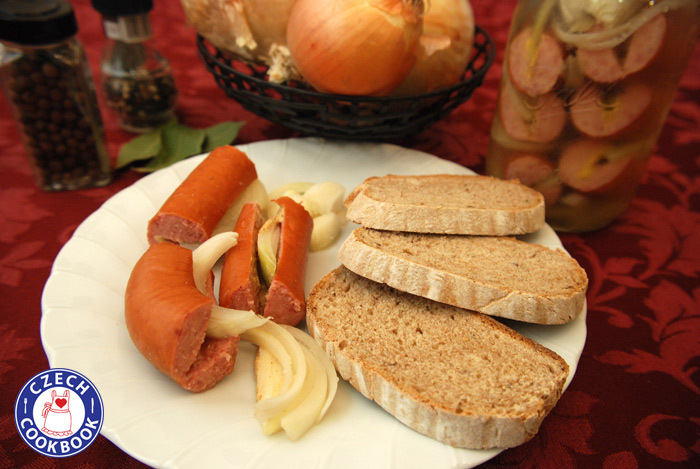 Thank you for your web, I sometiemes like to remember czech food and now i can cook it! 🙂 Will do nakladany hermelin for sure. Not sure when though. I have some recipes I have to do first. Thank you for recipe, I love utopence. I lived some time in CR. I hope You will put rybi salat recipe (it is after utopenci best for me). Your reciepes are great and site is best. Thank you Emir 🙂 Glad you enjoy it. Just finished pickling the utopenci recipe. I tripled it because my husband when he found out wanted me to make more! I had left over pickling juice and didn’t want to waste it so I cut up some onions and bell peppers, put them into a jar and added the rest of the juice. By the way I can’t keep enough Sunkova pomanzanka in the fridge. My husband is going nuts over these recipes. He keeps telling me how it reminds him of the old days. He hasn’t had any czech food since his father passed away. I’m so glad I found your website. Is the kielbasa fully cooked when you buy it? My Mom used to take ring bologna and put it in the fridge with vinegar and onions. She called this domace buš (not sure if that is spelled correctly). Have you heard this term used? Is utopenci the same thing? Hm never heard of this. I don’t think it is the same thing since utopenci are marinated in spices and other things. My grandmother did that, but she called it “depression utopenci”. …she did add the right spices. Also, I’m finding that 1 inch pieces work better for the folks eating my utopenci. I put these together a week ago. Tried one on day 5. On day 7 they are even better! I love all things pickled or fermented. The kielbasa came in a three-pack. They wouldn’t fit in 2 mason jars, so I used a glass gallon-sized jar. Plus that gave me plenty of room for extra brine, and I can’t ever leave a recipe alone, so I added some flavorful chilies to the mix. Excellent! I used pasillas, Hungarians, green jalapeños, and Serrano’s. All were relatively mild, except the Serrano’s, which still had the seeds and lit my tastebuds up a bit, but not too hot. All in all, delicious. These would pair nicely with pickled eggs and pickled Roma tomatoes on an appetizer spread or for a summer picnic item. Sounds great! ☺️ You can definitely experiment and add things you enjoy.